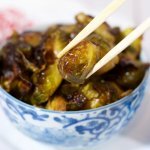 Crispy, sticky, sweet - These Asian Brussels Sprouts will change your life!! Cut of the ends of the sprouts and score the bottom (cutting an 'x' into the bottom to allow flavors to be better absorbed). Add Brussels sprouts to a mixing bowl with soy sauce, mirin, and rice vinegar. Toss to coat completely. Spread Brussels sprouts on a baking sheet and bake at 350° for 20 minutes.